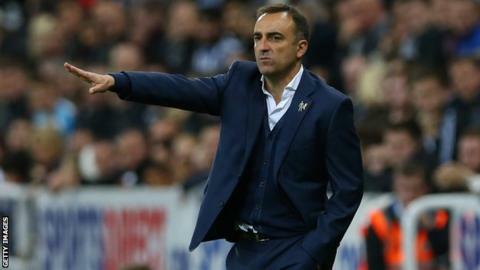 Sheffield Wednesday boss Carlos Carvalhal has said he is pleased with his side's depth after the League Cup third-round win at Newcastle. Lewis McGugan scored the only goal as Championship side Wednesday knocked out their Premier League opponents. McGugan was brought into the squad as one of 10 changes to the team which beat Fulham 3-2 on Saturday. "The players they are not the same level, but it's a small difference," Carvalhal told BBC Radio Sheffield. "We don't have 11 players that we can say is better than the other players. "The players that have not been playing, they did absolutely fantastic because we give them confidence. "We put them to play in this stadium against a Premier League team and we said to them we want to get to the next round and we believe in you to do that."